Unfortunately, Colorado leads the nation in annual avalanche deaths. Most victims are snowmobilers or backcountry skiers, but birders have been known to put themselves in harm's way too, especially when chasing after White-tailed Ptarmigan and Boreal Owl.Check the Colorado Avalanche Information Center for detailed information on avoiding avalanches and regular updates on avalanche danger. Everybody knows that severe cold can kill you. Everybody knows better than to wander around on Guanella Pass in the winter in a T-shirt and sandals. What many people don't know is that you can also get hypothermia in the mountains in summer, even when it is fifty degrees outside or more, especially if you end up getting wet. See this page for more information. 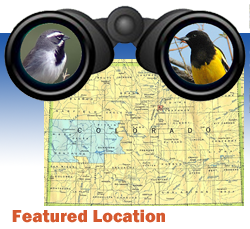 Visit the Colorado Lightning Resource Center for all the information you need. For those inexperienced with mountain driving, these simple driving tips may be of use. For current weather and driving conditions, including road conditions on mountain passes, visit the Colorado Department of Transportation. If wet, Colorado's dirt roads can be extremely treacherous, regardless of the car you are driving. The slick mud in the Southeast is particularly notorious, and has stranded more than one birder. Being an arid state, Colorado does not usually have big problems with mosquitos, but they can sometimes be fierce in the mountains. Even if you don't expect bites, however, it is a good idea to wear repellent, because in 2003 this state led the nation in human cases of West Nile Virus. Ticks can be a serious problem in lowland riparian and foothill habitats in spring and early summer. Although rare, both Rocky Mountain spotted fever and Lyme disease occur in Colorado's tick populations, so proper precautions are recommended. Finally, it should perhaps be mentioned that Black Widow spiders are not uncommon in shacks and woodpiles in southeast Colorado, including the blind at the Campo lek. Colorado's rattlesnakes are not normally aggressive, but you don't want to step on one. All you need to do to avoid them is watch where you put your hands and feet when in rattler country, which is essentially everywhere in the state below about 7000 feet, minus urban areas. Rattlesnakes are generally only active in the warmer months, taking shelter when it is too hot or too cold. Those new to Colorado may be surprised how quickly the sun can cause burns here. The high elevation means there is less of Earth's atmosphere between you and it, meaning that levels of ultraviolet light tend to be higher. Always bring sunscreen into the field. Colorado is an arid state. The majority of its river and reservoir water comes from snowmelt. The humidity here is extremely low, often uncomfortably so for recent arrivals to the state. Always bring plenty of water into the field, particularly if you are in the southern and western deserts, where you should plan on bringing a gallon per person per day. For a great overview of other potential hazards, including encounters with bears and mountain lions, visit Rocky Mountain National Park's hazards page.